Today’s homeowners agree that their outdoor spaces are among the most imports aspect of their home. While there are many options available for decking and pergolas Bayswater residents can choose from, when they want quality, style and durability, they select Quality AMG Constructions. 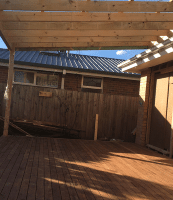 We only offer the highest quality building services when modifying, renovating or adding a deck or pergola to your property. When we provide our construction services, your satisfaction and the quality of your decking or pergola is our priority. You can trust the AMG pergolas and decking Bayswater to create a beautiful place where you can sit back and relax in the peace and comfort of your own home. Are you thinking about building a new backyard deck for the coming summer? Or perhaps you’ve been thinking of updating your existing deck? Over time, harsh weather conditions can wreak havoc with once beautiful decking, causing the timber to look old and tired. Here at AMG, we can provide you with a complete solution for your outdoor decking. We specialise in decks of all sizes, built using high-quality Australian timber and hardware. Whether for entertaining, dining or relaxing, when looking for decking Bayswater homeowners turn to AMG to deliver a great place to sit outside and socialise with family and friends. Homeowners wanting to add an outdoor entertaining space in their homes where they can relax and entertain will find the addition of a pergola to be a great way to achieve what they want. Pergolas can be used over existing decks and in gardens or by the pool to provide shade and add beauty to your backyard. They give a unique dimension to any backyard and offer an inviting place for your friends and family to enjoy nature, relax and unwind. For stylish and practical pergolas Bayswater, you’ve come to the right place. Here at AMG, our pergolas are built to make the most of the natural light in your garden and improve the overall appearance of your home. The team behind AMG Quality Constructions has worked on numerous projects including verandahs, carports, decking, pergolas and much more. With quality workmanship and superior knowledge, we ensure that your project is completed on time and budget. We use only the very best quality materials for all of our projects while offering a complete design, approval and construction service. We guarantee that you will be impressed and that your friends and family will be envious of your new home addition! To find out more about decking and pergolas Bayswater residents can get in touch with the friendly AMG team by calling 0432 170 146.